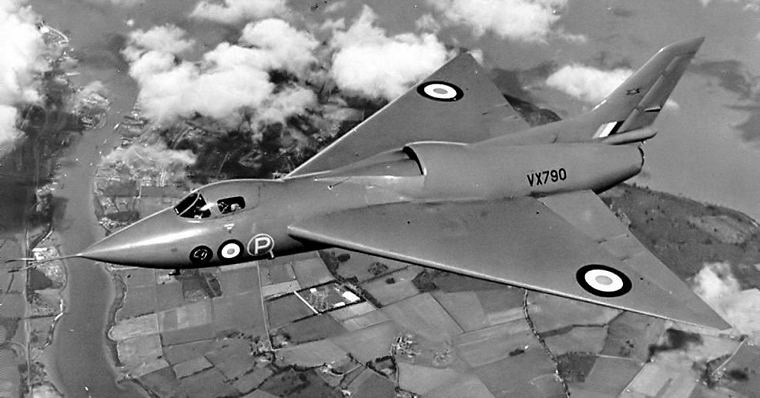 The Avro 707 was a British one third scale version of the Vulcan experimental aircraft built to test, in particular, the low-speed characteristics of the tailless thick delta wing configuration chosen for the Avro 698 jet bomber, later named the Vulcan. Principally the work of Stuart D. Davies, Avro chief designer the diminutive 707 initially incorporated a wing with about 50° sweep, without a horizontal tail on a fin with trailing edge sweep. The prototypes were ordered by the Ministry of Supply to Specification E.15/48 and were produced quickly using a few components from other aircraft including the first prototype using a Gloster Meteor canopy. The first 707 first flew from Boscombe Down on 4 September 1949 with S.E. "Red" Esler, at the controls. The prototype crashed less than a month later, on 30 September. The next prototype had a longer nose, different cockpit canopy, a wing of different (51°) sweep and a longer nose wheel leg to provide the high angle of incidence required by deltas for landing and take-off. It first flew on 6 September 1950. Both these aircraft were built to test low speed characteristics. The third aircraft, 707A, was built for higher speed testing. When the Vulcan appeared, it looked very much like an enlarged 707A. Later, this 707A was used to test the compound leading edge sweep subsequently used on all Vulcans. Although the first Vulcan prototype was already flying, a second 707A WZ736 was built to speed the development programme, making its maiden flight on 20 February 1953. The Avro 707s made public appearances at the Farnborough Airshows in both September 1952 and 1953. 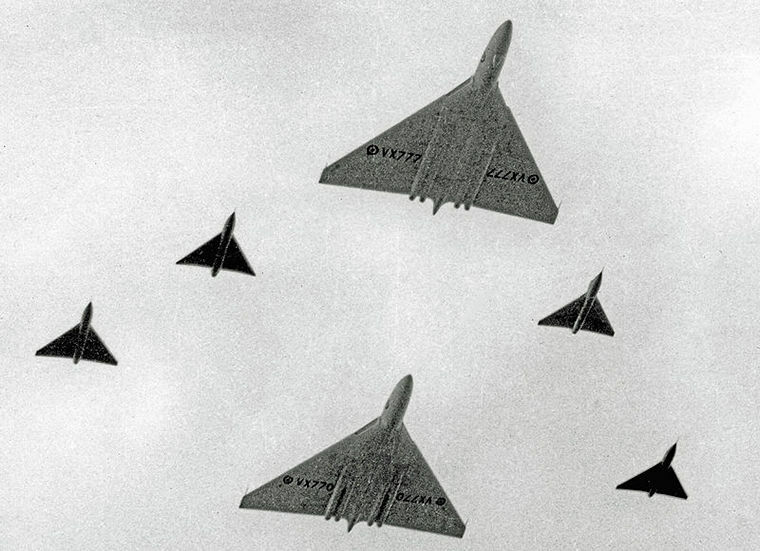 In 1952, the first prototype Vulcan flew with the 707s A and B and in 1953, the four surviving 707s flew alongside the first two Avro 698 Vulcan prototypes. Even after the Vulcan development phase was over, the four surviving 707s, resplendent in individual bright blue, red, orange and silver (natural metal) colour schemes, continued in use as research aircraft.